My wife likes to shop. I’m sure those are five words that have never been said in that order before. But she does like to shop, both in-store and online, and it is often other people that she likes to shop for. Not only that, she likes to spread the joy of shopping to other people in much the same way a pot dealer promotes the joy of cannabis. I resist shopping. Rose is always trying to get me to buy clothes or shoes or whatever but I resist being drawn to the dark side. With no other recourse, she sometimes buys me stuff . . . for my own good. Recently a box arrived in the mail. It was from a company called Neater Pet Brands. In the box was a Neater Scooper and a Neater Feeder for cats. 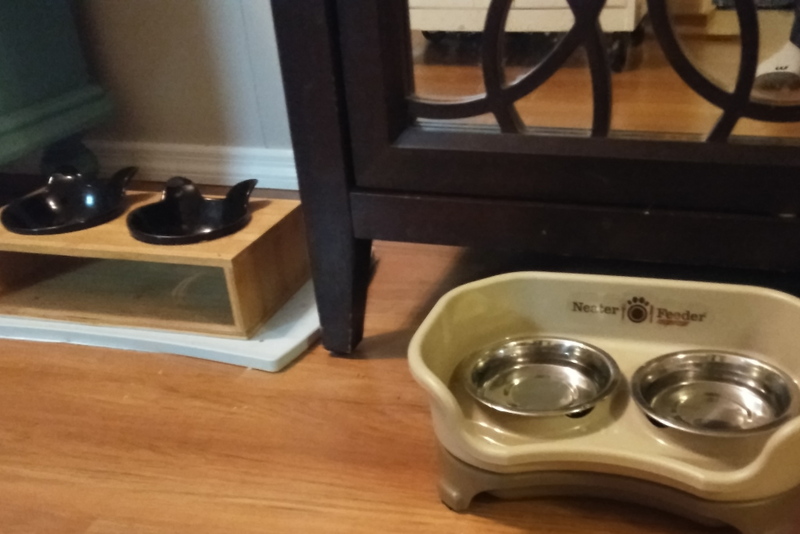 Since I do almost all of the poop scooping and I feed the cats as well as maintain their water bowls, Rose thought these products would make my life easier. 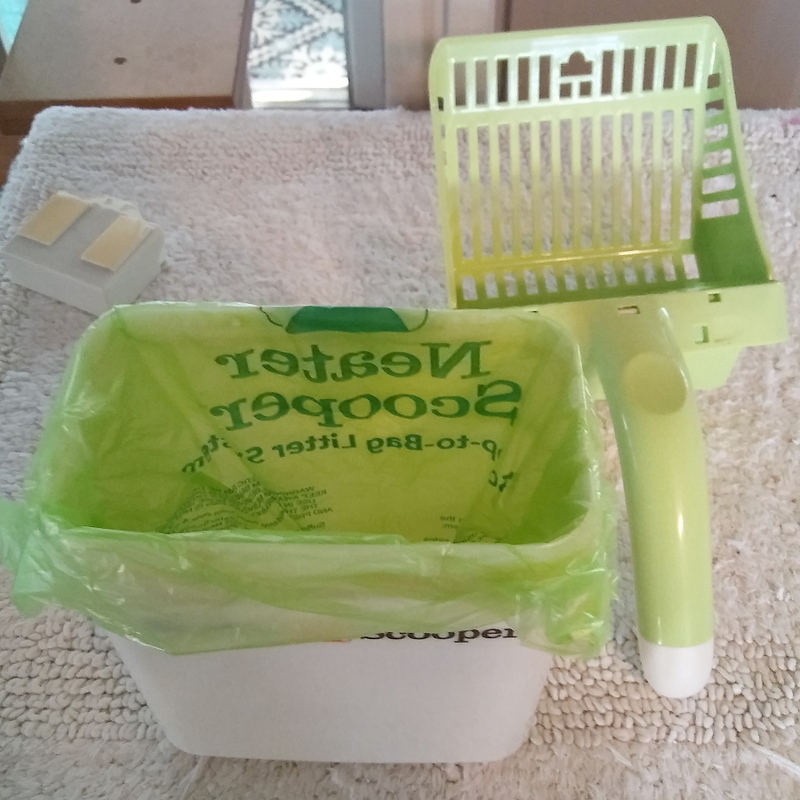 I linked to the company’s website but I am fairly certain she bought them from a third party because she said that the feeder was free with the purchase of the scooper and bags. I don’t know what she paid (probably separate shipping and handling) but I doubt anything was free. 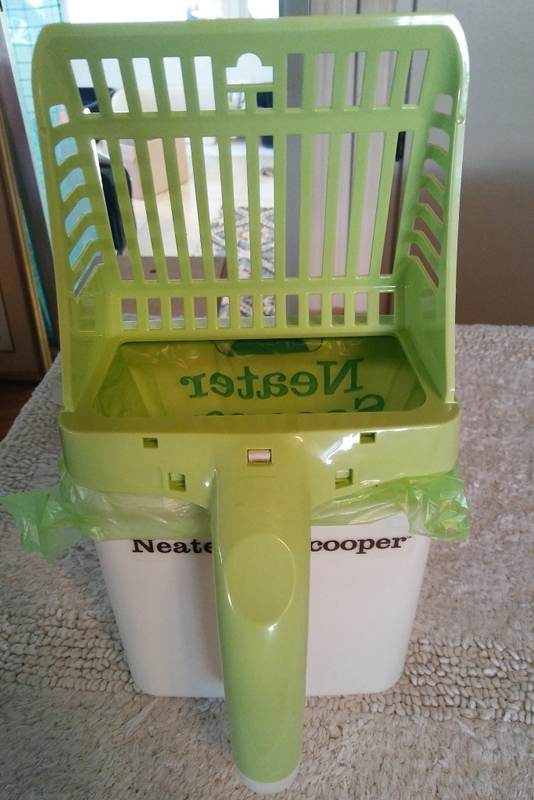 The scooper has a bag that attaches to it and a one-way opening to allow the waste to drop into the bag. I found it to be too bulky for my taste and I kept dumping too much litter into the bag. I’m sure with practice I would get used to how it works but even if I was comfortable with it I still felt like the effort to put the bag on and then take it off again was more trouble than it was worth. I have no problem with holding a scoop in one hand and a bag in the other so I think this is a solution to a problem that doesn’t exist. We ended up throwing the scooper and the bags in the trash but then I pulled them out and I plan on asking my neighbor if she wants them when I see her. The other thing that came, the feeder, is more useful. We already have an elevated feeder so I decided to use this one for water since it catches and contains any water that spills over the edge. Some of our cats, like Floki, lick the edge of the water bowl causing water to spill over the edge and get on the floor, which means we have to put a paper towel under the bowl. I think it is designed to have food on one side and water on the other but I like to keep the water away from the food, at least somewhat. I do this because I used to have one or two cats that would put food in the water bowl but I also read that cats don’t like drinking water that is close to food. I have not found that to be an issue but maybe it matters even a little bit to them. All in all, I think the feeder is good but the scooper is not so good. What do you think? Would you like to try the scooper? 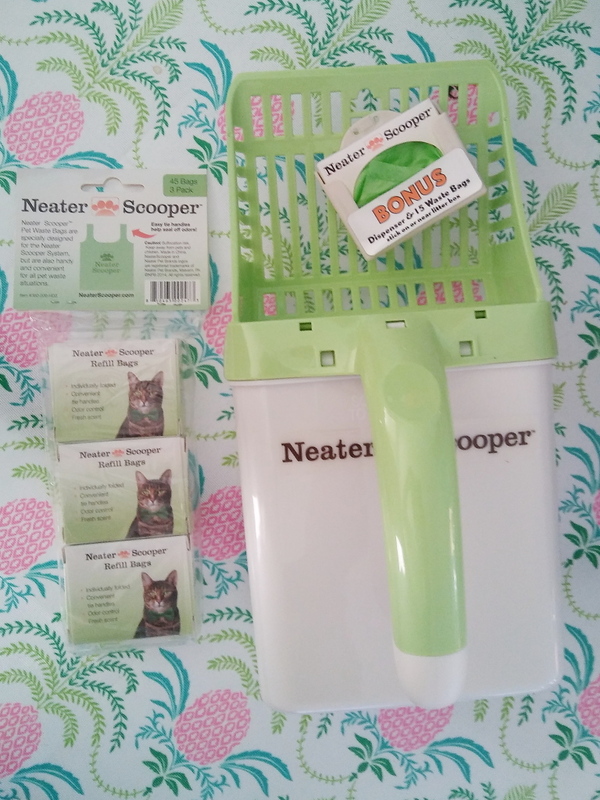 This entry was posted in Uncategorized and tagged litter scoop, neater feeder, neater scooper, water bowl on January 25, 2018 by Charles Huss. I agree; the scooper is nicely made but it does seem like there’s to much time involved in set up when one just needs to scoop and go…no pun intended there. If it’s not overly large, it might work with dog owners while out on walks; the scoop and bags only. I assume the bags are bio degradable ? I don’t think it would work too good for dogs because you have to get it under the poop. That might be hard to do depending on where the dog poops. I don’t know if the bags are biodegradable. They might be. The scooper did look big and cumbersome. Maybe you’d get used to using it. But the feeder looks great. We could use something like that since some of us make a mess when eating. It works great for the water. 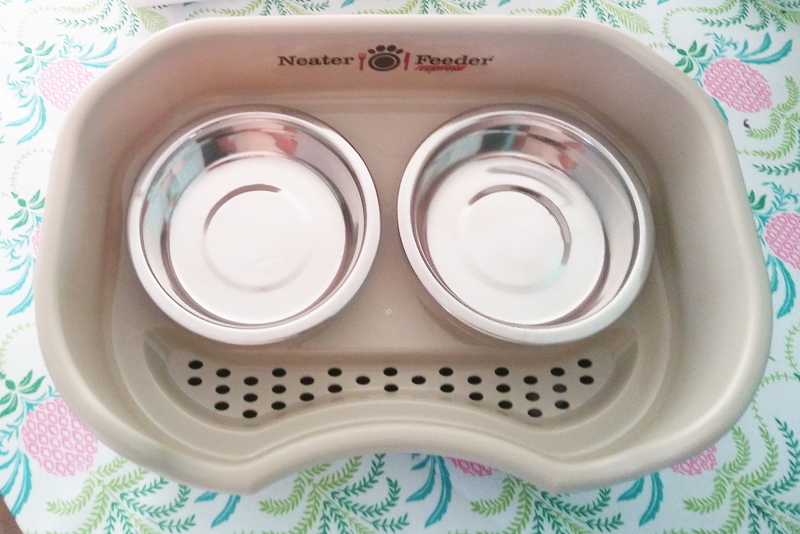 I reviewed the Neater Feeder a few years ago on Dakota’s blog………..ended up getting rid of it (after loving it at first) because if one morsel of food fell under the bowl or something Dakota would dump everything over (including the water)…….I used to love it until he started doing that. I can see that being a problem. I appreciate your honest review. I would pass on the scooper. Probably a good idea but the bowl is not bad. My human agrees with you – she thinks the scooper looks bulky. It might be okay for some people but for me the bulk made it awkward. I agree that the scooper seems like a lot of “stuff” to do for what’s simple with a scoop and bag in each hand. I’d pass on that one too! They invented a problem more than a scooper.